So I was away from the blog for another little while there, but now I'm back to bring everyone up-to-date. The end of last week was a mixture of productivity and then swift and relentless sleepiness. Thursday and Friday involved a lot of manual as well as computer work. I worked for the college and then did a bunch of translating for this manga project that Dash and I are on. Have I mentioned it to you before? It's the digital release of Japanese manga Harlequin titles. Everyone's familiar with Harlequin, right? The romance novels written by women for women? I've never read them myself, but they range from historical fiction to modern office environment with one common theme holding them together -- romance stories with strong female leads that inevitably end up with a handsome rich guy. Ha! Anyway, Harlequin novels were adopted into the Japanese language, then subsequently into manga (comic) versions, which I now work on translating them back into their mother tongue of English, albeit in a very different format. Phew! Dash and I are a real Husband & Wife Team on the project, as I do the translations and he lays out the English text onto the pages. I love it!! But today was a better day in terms of balance. We actually made it to church (for once!) and then had the sweet little Stalter kiddos over. I wanted a way to get the kids' minds off the TV without downright removing the screen (Dash and I do like to watch things together on occasion). Ever since that lice/snow crisis back in February, we'd fallen into a routine of Thomas and/or Daniel Tiger...every day! >_< And it felt like the kids were being less and less satisfied with just one episode and would beg and whine for more. 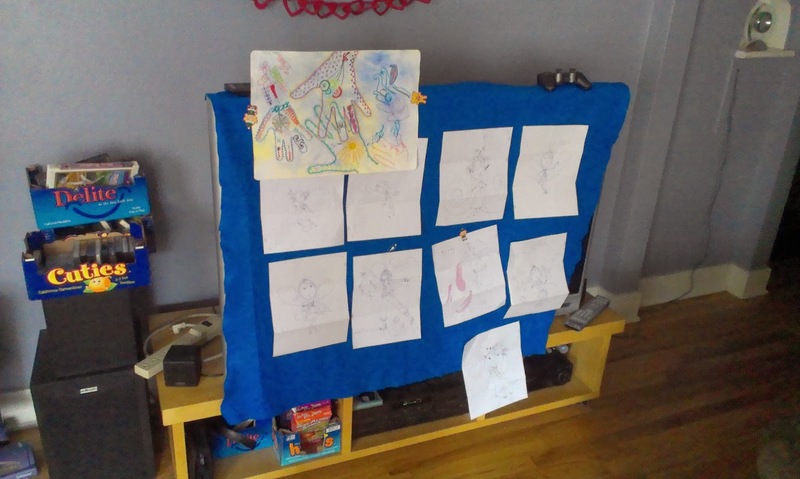 So I said enough is enough and I covered the TV with a big felt sheet that we are going to cover with our own entertainment -- drawings and stories made by our own hands and minds! Simple tape on the back of the drawings works okay-ish, but I also attached velcro tape to some clips which is another way that we can easily cycle out old piece and cycle in new ones. Well, now to do more translating work. Hope you guys had a good weekend and are looking forward to a good week! Also, do you seek to reduce TV-watching in your homes too? What is your routine like and/or how do you deal with it? Okay, that''s all for now. As the weather improves, the tv is off much much more in our house. The sand box has been a recent distraction that keeps G. busy for over an hour. Though I do find her naked in the sand every time. DOH!